We’ve discussed the basics of cannabis regulation in California and cannabis regulation in Nevada, both of which play host to several MedMen locations. Now we are onto the next space MedMen calls home; shifting over to the east coast to highlight the rules of cannabis consumption in the Empire State. The MedMen outposts that span New York, Nevada, and California are all united by the dedication to quality and accessibility that we continually strive to provide—but our New York marijuana dispensaries offer up one major difference: the recreational use of marijuana is not yet legal in New York. Currently, the only way one can legally consume cannabis in New York is via their medical marijuana program, which became legal in 2016. There are 12 conditions that enable an individual to qualify for medical marijuana use, but the tight restrictions are beginning to shift. A few months back, New York Governor Andrew Cuomo announced his plan to legalize and regulate adult marijuana consumption by creating a working group that consists of 20 experts in fields that include safety, economics, and public health. This working group is set to draft a bill that will be presented to state legislature in January of 2019—it’s a step in an exciting direction that may enable those in New York to legally smoke, consume, and use marijuana in a similar fashion to those in states where recreational cannabis use is legal. Until then, there are specific rules to watch out for within the medical marijuana program. In order to use medical marijuana, you must first qualify under the set conditions before you become certified by a registered practitioner. From there, you will receive an ID card, which you will then use to go purchase marijuana from a registered dispensary. And lucky for you, there are numerous MedMen weed dispensaries in New York. Once you’ve got your product, there’s another set of regulations. You must have your ID card with you when in possession of cannabis, and there is no vaping in public and in any location in which smoking is prohibited. Much like any other state where any form of weed is allowed, there is also no consumption of marijuana while in any vehicle. If you currently have a medical marijuana card in New York, our dispensaries offer up numerous products for your needs. Whether you need a marijuana item to ease pain, aid sleep, or curb an ailment, our helpful staff is ready and willing to help you find the product that is best for you. 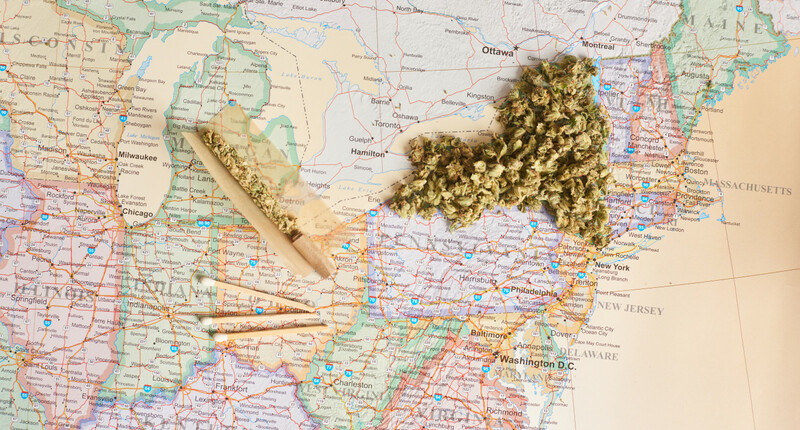 From our medical marijuana dispensaries in New York City and dispensaries in Buffalo to the dispensaries in Syracuse and dispensaries in Lake Success, the State of New York has a touch of MedMen fit for any marijuana need.